Sometime in June, when most schools reopen for the new academic year, you will spot at least a couple of photographs in the newspaper of small children bowed down under the weight of their enormous school bags. Accompanied by a thought provoking caption, these photographs hold our attention for some time and then we go back to packing our child’s school bag. Occasionally a politician or activist says something about the number of books children need to carry. Shock and outrage is expressed in indignant “Letters to the Editor”. The indignation is picked up by enthusiastic reporters and results in a couple of eye-opening articles on what the school-going child has to suffer in the name of education. But soon all this passes, and little attention is spared for the literal burden the child is forced to carry to school everyday. There is a collective amnesia on the part of parents and educators. A few months into the academic year, even the practical aspects and worries of going to school with heavy bags are submerged under more immediate concerns about exams, handwriting and fears that the child may require tuitions. Earnest meetings with school teachers and note-sharing sessions with other parents invariably concentrate on issues of this sort. The problem of the school bag pales in significance. Bent under the weight of these items, each absolutely “essential” for surviving a day at school, the child wends his way to class. The mind boggles at an education system that demands this kind of slave labour in the name of acquiring knowledge. What’s sad is that invariably it is the younger children who end up carrying huge loads to school. Try reasoning with a child of the primary class, explaining that he doesn’t need all the books at school everyday and that they can be safely left at home. All the books, this tiny child will announce firmly, are needed everyday at school. If you actually remove those that you think are not necessary, you can be sure that these will be sneaked back into the bag. Suggest that some of the books or notebooks be left at home till they are actually needed at school, and the teacher reacts with horror. And woe betides any child who actually leaves a notebook at home. Disgrace and almost certain punishment await him. This brings one to the question – is the acquisition of knowledge linked to the number of books carried to school everyday or even to the weight of the school bag? As children move higher in the school hierarchy, they become bolder and less nervous about taking their own decisions. Their bags refl ect this change in their attitude: a high school student carries the bare minimum of books to school while a Class I student invariably carries all his books. One accepts that knowledge has to be organized into neat little sections, or books. Hence, we need different books for the different subjects studied everyday. But is there any evidence that carrying different books for the various subjects helps the 6-8 year old learn better? Would it be difficult to ensure that the child studies math, language and science in ONE notebook without losing sight of the differences between them? As they go higher, we add to this list of books. We organize education around the division of modes of writing (test, homework – often a repetition of the day’s school work – and class work) and multiply the sites of writing (test books and homework books). There is, obviously, a larger philosophy at work here. Allocating different notebooks for various purposes (like work to be done at home, work to be done in the school and work to be done when the child is being tested) does help the child learn discipline. At least, that is what most educationists seem to believe, if their almost fanatic insistence on separate notebooks for different purposes is anything to go by. The principle is commendable, as is the invaluable lesson that this hopes to teach children. Where this philosophy loses sight of its purpose is in the blind emphasis on following the rule. This insistence has evolved out of a desire to inculcate discipline in school children; it does not take into account its effect on the children it hopes to benefit. If the harm wrought on the tender bones of the school children is at all taken into consideration, it is invariably weighed (unfavorably) against the “larger and more enduring” good that the discipline will do. What is interesting is that this ‘discipline’ is a system perfected by each individual school. That is part of the trouble with questioning the weight of the school bag – taking on the idiosyncrasies of individual teachers is far easier than taking on an institutional diktat. Most parents quail at the thought of questioning the rules laid down by the school, and those who dare to question are intimidated by the high handedness of the school authorities. The school-bag debate is not a new one. The late R. K. Narayan, who created some of the most memorable stories about childhood, was perhaps the fi rst to voice concern over the practice of carrying large bags to school. As a member of the Rajya Sabha, it was of the school bag that R. K. Narayan spoke in his debut (and only) speech. “The school bag,” he said, “has become an inevitable burden for the child. … I am now pleading for abolition of the school bag, as a national policy, by an ordinance if necessary.” Why are we – at a policy level – unable to reduce the burden of the school child? Surely the authorities can do something about this aspect of education. Parents are forced to evolve their own methods of reducing the burden on their children’s backs. Sumana, parent of one, says that she simply studies the timetable and then removes the books that are not required for the day. She believes that each child should have two sets of books, so that one can be left at school while the other can be left at home. Sunita ensures that her son does not carry any book that is not absolutely essential for the day at school. She appreciates the fact that her son’s school has ensured that each child carries a three-in-one notebook, thus reducing the weight of two additional notebooks. Radhika, however, points out those teachers seldom stick to a prescribed timetable, forcing students to carry all their books every day. Toys to share with friends. Lunch and a water bottle. Drawing notebook and color pencils. We refer to ‘tender’ children and discuss the joys of the ‘growing years’ little realizing that we, their parents and educators, have together condemned them to a lifetime of back pain and bad postures. Back pain, for long the domain of the old and the infirm, will soon be a regular complaint of school going children. This is hardly surprising, considering the fact that a child is capable of carrying only ten per cent of his body weight. This means that a Class 2 student who weighs 25kgs, should optimally carry weights up to 2.5kgs: which is laughable, since most school bags carried by children at that level weigh at least 4 to 5kgs. And that on a good day, when the teachers haven’t asked the children to cart along assorted charts and projects to school. Does the lack of a ruling from either the Supreme Court or educational bodies absolve the schools of the necessity of doing something, anything to help their students? Some measures have been attempted by specific authorities to address this problem but no nation-wide debate has been opened up or solutions offered. Recently, the Chandigarh government announced that it would do away with the necessity of carrying school bags for children up to Class 2. The NCERT has mooted a suggestion that textbooks be split into three sections, and students only carry the section being taught that term. Very little progress has been made in implementing these plans and children continue to stagger under the weight of their school bags. Until then, principals and teachers can surely come up with some means to ensure that the tender backs of their students are not permanently injured. Some schools have come up with innovative ways of ensuring that going to school is no longer the back breaking chore it was. A school in Kerala has actually banned big bags and is considering ‘prescribing’ identical bags for all school children. It is time other schools also take steps to ease the burden off the backs of their students and wait for the smiles of relief and joy spread across the faces, as they walk, tall and straight, to school. All the way to school and home! Three textbooks, one each of English, Hindi and Math. Four notebooks, each 200 pages thick, one each for English, Hindi, Math and EVS. Four activity books, one each for English, Hindi, Math and EVS. One pencil box, bursting with a variety of colour pencils, pencils, eraser, scale, crayons and sketch pens. In addition to these are the lunch box and the water bottle. 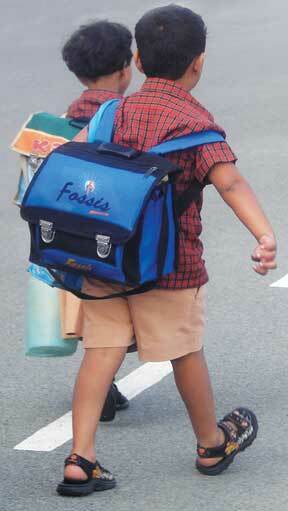 Parents worry about the school bag that their child lugs to school every day. The large number of subjects that are part of the curriculum means that a large number of notebooks and books have to be carried to school everyday. Obviously, leaving some of them out is not an option. What can parents do? Here are some suggestions to help ease the burden on your child’s back. Study the timetable for each day and let your child take only the books necessary for the day. Help your child pack the bag. Ensure that the heavier books are closer to the back. If the heavier items are on the outside of the bag, this tends to throw his centre of gravity out of balance, thereby resulting in bad posture and increasing the chances of straining his back. Help your child adjust the shoulder straps of the bag. Make sure that the straps of the backpack are tightened so that the bag rests on the back. Check your child’s posture after he has slung the bag on. 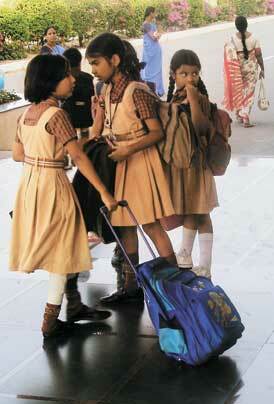 If you notice your child leaning forward, check: is the bag too heavy or has it not been packed properly? Purchase a sturdy, well-designed bag with padded shoulder straps. A backpack is usually far more comfortable than a bag that slings across one shoulder. Buying a large backpack is not necessarily a good idea. It means that your child lugs around the excess weight of the bag, along with the weight of the books. Buy a bag that is just right for the books your child needs to carry. 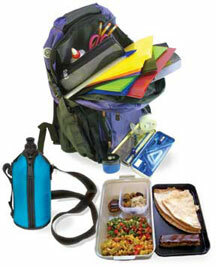 Since the recent trend has abolished the use of separate lunch baskets, look for a bag that has separate compartments for various things like the lunch box and the water bottle. Parents tend to know all and this often has them overriding the wishes of the child. If your child is not happy with the compact, ergonomically designed bag that you have chosen, he is not going to carry it properly. He could experiment with ways to carry it and could end up harming himself. Explain to your child why the bag that has been chosen is the best for him. Reaching a compromise regarding patterns or colour of the bag will work far better than forcing your opinions and your choice on him. A bag with built-in wheels is a good option since this takes the weight off the child’s back. However, ensure that there is a proper approach road to the school so that he can drag his bag. If you child ends up hoisting the bag on his back, this will defeat the purpose of buying a wheelie. How can educators help reduce the load of school children? Provide each classroom in the primary section of the school with a sturdy cupboard that can be locked. This can be used to store all the notebooks thus relieving the children of the task of carrying them back and forth. For high school students, lockers could be provided. These can be used to store books that the student does not require at home. Ensure that only one teacher gives homework each day. The child will have to carry only that notebook home and bring it back the next day. Textbooks can be left at home. The teacher can inform the children when they are required to carry them to school. The teachers can use a three in one or five in one notebook (the pages split into single ruled and four ruled so that it can be used for all the subjects), thus ensuring that the child has to carry only that one notebook everyday. The author is a freelance writer based in Hyderabad. She can be reached at nandsnayar@yahoo.co.in.